A majority of the apps on my iPad were free. 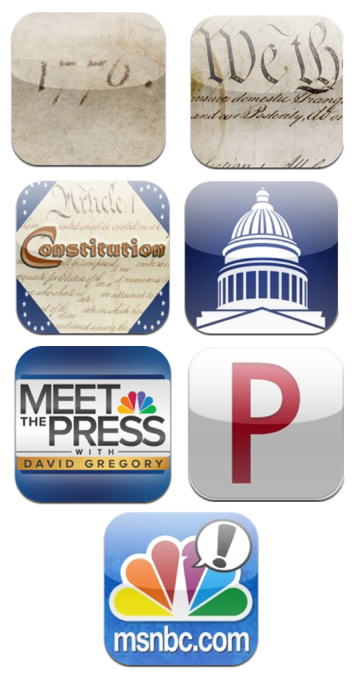 The first US Government content-related apps I downloaded were the Constitution for iPad, the Declaration (of Independence) for iPad. Great reference for both US History and US Government. Both apps allow for exploration of the main document text, the biographies of the signers of each document, information about the parchment on which the documents are written, and the famous paintings of both the Declaration of Independence and the Constitution. The Constitution and Federalist Papers app is another that has background about the writing of the Constitution, the text of the documents, the Federalist papers and images of the pages of the Constitution. For more current US Government-related content, MyCongress follows any senators or representatives by zip code and shows recent news, the Congressperson’s YouTube channel, and Twitter Feed (if s/he Tweets). NBC’s Meet the Press provides instant access to interviews on the current issues of the government with interviews, the roundtable, and audio podcasts. Politico is also helpful to keep up on the 2010 Presidential race and current activities of Congress and the Presidency. Finally, the msnbc.com Cartoons (with cartoons from the Cagle cartoon library, I love them) keeps up on the current funny.